SiriusXM subscribers will have the opportunity to win tickets to the private intimate performance through an invitation sent by e-mail to qualified subscribers who have consented to e-mail marketing from SiriusXM and who have registered their music interests with the music service. Subscribers since July 20, 2018 will be able to enter for the chance to win a trip for two to Los Angeles, CA including airfare, hotel stay and a pair of tickets to the event; full details are available from the company. SiriusXM will broadcast Slash’s club performance on the day of the album’s release - September 21 at 8:00 pm ET - on SiriusXM's Octane, via satellite on channel 37, through the SiriusXM app on smartphones and other connected devices, as well as online at siriusxm.com; the concert will also air simultaneously on Howard Stern's Howard 101 channel. “Living The Dream” marks the Guns N’ Roses guitarist’s fourth solo album and third with his band featuring vocalist Myles Kennedy, drummer Brent Fitz, bassist Todd Kerns and guitarist Frank Sidoris. 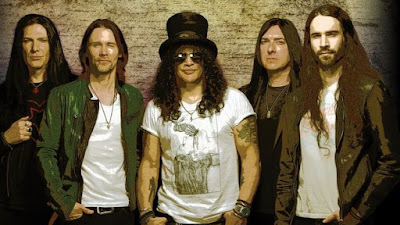 Slash worked on “Living The Dream” with producer Michael “Elvis” Baskette (Alter Bridge, Iggy Pop, Incubus); the set is the follow-up to 2014’s “World On Fire”, which debuted and peaked at No. 10 on the US Billboard 200. Slash and the band will launch ”Living The Dream” – which is being previewed with the lead single, “Driving Rain” – on a month-long fall tour of North America.